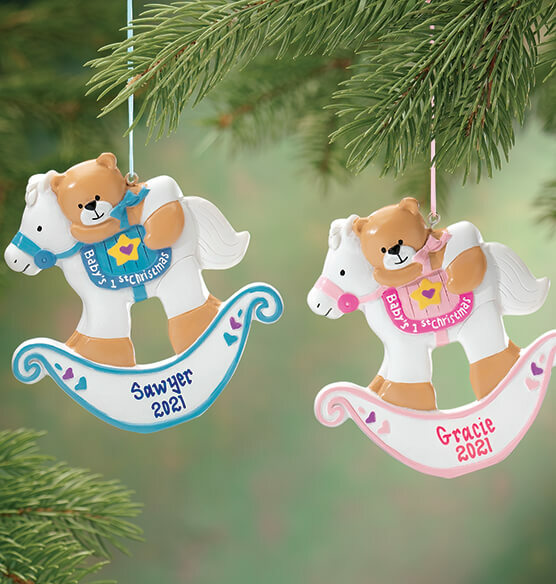 Personalized baby's first Christmas rocking horse ornament features a cute, teddy-loving rocking horse. Can be personalized for baby ... creating a lasting memory. Specify name; limit 1 line, 12 letters/spaces. Specify year; limit 4 characters. Resin. 3 7/8" long x 1/2" wide x 4" high. Gave it as a gift. Just loved it! What a special way to celebrate our grand-daughters 1st Christmas and birthday! This is a Christmas gift for our first great-grandchild. I thought it was the best one I saw. I got a First Baby's Christmas for my last two great-grand kids. I had to have another one for my new great grandbaby. The fact that they put the name and year they were born is special. Gave to my granddaughter. First Christmas my son and daughter in law love it . This is a really cute ornament. This was purchased for my grandsons first Christmas. It is great and they spelled his name right the first time. This is for my 1st great niece. Bought for my granddaughter and I am pleased with the quality. products arrived on time and out of 5 ornaments only one was incorrectly sent. I had ordered a baseball and got a football. I have received the correct one and I am satisfied. I bought this for a first great-granddaughter. It's cute, but not the quality I had hope. However, sentimental value will make it very special to the little girl as she gets older. Love the ornament except for the handwriting for the personalization Quality wasn't as good as it could've been. The paint could've been done better. Very pretty first Christmas ornaments for my first two great-grandchildren. I got this ornament and was disappointed. The coloring is not bright and vivid like the picture, mine is beige. It is thick and bulky not like most of the other clay ornaments. The paint job is sloppy and it just looks cheap. I am sad I chose this one and not another one. The ornament pictured looks great, unfortunately the one I got is not as nice. The details were poorly painted. Even the word baby is smudged. Sadly I got it monogrammed, so I cannot return it. this looked so cute in the catalog and online and when i got it i was so disappointed. the paint job is horrific. I wanted something special for my baby's 1st christmas and this definately was not it. I really loved this ornament but the painting on it was terrible. Off center, smudged and just sloppy. I even reordered it and second one was same. Such a cute ornament...the s is even missing on Christmas. Looks like a first grader painted it. The name and date were fine but ornament itself was off. It was for a gift but could not give in this condition. Sorry, but quality is not the usual Miles Kimball. This came damaged it had glue from the price tag that was taken out to do the personalization and it was dirty from the glue and sticky! Very disappointed with the lettering "Baby's First Christmas".....faded---looks used. A marker was used to write in the baby's name and year. I should have gone to the mall; they do the same thing and I wouldn't have paid for shipping. What material are these ornaments made of? BEST ANSWER: Thank you for your question. The ornament is made of Resin. We hope this information will be of help to you. the material is a pretty durable plaster. Of course, it will break, if it is dropped. Good quality!